Remember when having LTE connectivity on a smartphone was a big deal? Well, that time is long gone now as the feature is present even on some mid-range devices. One of them is the LG Optimus F5,which we are now being given the chance to check out. With a screen of 4.3 inches and thickness of 9.3 millimeters, the LG Optimus F5 is positioned in the smartphones’ Goldilocks Zone – it fits well in the hand and operating it requires little effort whatsoever since it is neither too big, neither too small for the average hand. The screen panel is made using IPSLCD technology, so seeing that it has great viewing angles and color accuracy comes as no surprise. Its resolution of 540 by 960 pixels is also okay, and although it doesn’t quite fit in the HD category, a pixel density of 256ppi is sufficient for the needs of the not-so-demanding consumers. There is a 1.2GHz dual-core processor running inside the LG Optimus F5, paired with a respectable 1GB of RAM. The back side of the LG Optimus F5 is graced by a 5-megapixel auto-focus camera. What you also need to know is that you get 8GB of storage with the LG Optimus F5, which isn’t awhole lot, so popping in a microSD card of your choice is advisable. Behind the smartphone’s backcover is tucked a 2,150mAh cell, leading us to believe that battery life won’t be an issue. Android 4.1.2 Jelly Bean runs out of the box on the LG Optimus F5 modified using the company’s custom Android skin. And that’s the LG Optimus F5 for you, in a nutshell. It is shaping up like an okay mid-range smartphone with pretty average specs and LTE support among its notable perks. 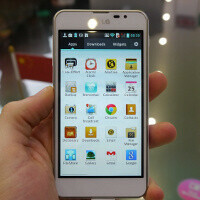 The handset isscheduled to launch in Europe no later than Q2 of 2013. Hello iPhone F5!!! WTF LG? No flash for the camera? What were you thinking LG!